A white girl and a Pakistani guy fall in love. Unfortunately, their families both have their fair share of prejudices... The Big Sick is directed by Michael Showalter and was released on Jul 14th, 2017. 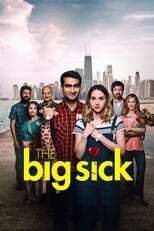 Director Michael Showalter's Comedy & Drama movie The Big Sick is produced by Amazon Studios & FilmNation Entertainment & was released 2017-06-23.